Pistol Pete Maravich had his number retired in Utah in December of 1985. The Jazz and New Orleans were synonymous—and Pistol Pete Maravich was synonymous with both. So in the summer of 1979, one man’s opinion seemed to matter most of all. “I think everybody wondered what Pete thought,” said David Fredman, the team’s former head of public relations. Maravich was a legend in Louisiana. He set the NCAA’s scoring record in three years at LSU while averaging 44 points per game. When, in the summer of 1977, he signed a five-year contract extension with the Jazz, he made it clear where he wanted to be. “I’ve said it before and I sincerely mean it when I say that I’ve been all over the United States and there is no better place to live and work than the city of New Orleans,” Maravich said. Two years later, the franchise’s most iconic player put on a brave face as his team left his beloved home behind. The Pistol’s time in Utah would be short lived—less than half of one season, a campaign marked by injury and conflict and DNP-CDs. But it’s a credit to Maravich’s legend and importance to the Jazz franchise that four decades later, his brief stop in Utah still stirs up emotions for the men who brought him to Salt Lake City and then sent him packing. Tom Nissalke, the first head coach of the Utah Jazz, had been a Maravich fan. Nissalke coached at Tulane in New Orleans in the 1960s and frequently made the drive to Baton Rouge to watch Maravich’s dazzling performances. But Nissalke was less than enamored with Maravich when he arrived in Utah a decade and two knee surgeries later. Maravich had been optimistic before the start of the 1979-80 season, the franchise’s first in Utah. Nissalke, like many others, could see that Maravich was unhappy with having to leave New Orleans. The star guard’s knee, however, was an even bigger problem. Nissalke saw a shadow of a former star and sat it at the end of the bench. On November 27, 1979, the Jazz hosted the Lakers. It was Pistol Pete Maravich Poster Night, but Maravich never got into the game. So Layden went looking for a solution. He called Boston’s Red Auerbach, who he knew liked Maravich and his father. “Would you want Pete Maravich?” Layden recalled asking. “He can’t play, can he?” Auerbach surmised. Next, Layden had to talk with Maravich. The two men met at his North Salt Lake home, where Layden gave the player two options—he could be waived and retire or he could join another team. Either way he would get paid. Maravich wanted to keep playing. “He said he thought he’d be better next year,” Layden said. Maravich had been benched for 28 straight games before he was waived on January 18, 1980. 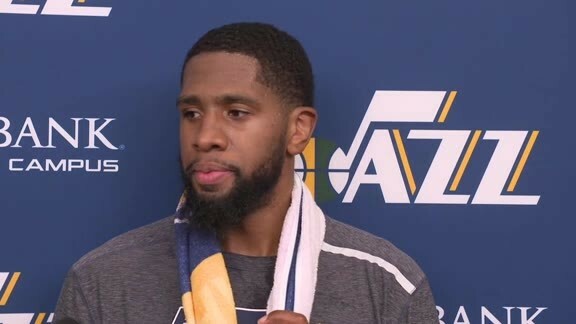 Still, the move was not an easy one for many within the Jazz organization. “It was tough for [former Jazz owner] Sam Battistone because he’d had him in New Orleans when Pete was great,” Nissalke said. Fredman, now the Jazz’s director of pro player personnel, still has heartache over the way Maravich’s tenure with the Jazz ended. Maravich only played in 17 games for the Utah Jazz, but he averaged 17.1 points and 3.2 assists in those contests. “I did think he could still play,” Fredman said. All these years later, Fredman still smiles thinking of the Jazz’s second ever win at the Salt Palace. Maravich came alive, scoring 21 of his 31 points in an eight-minute burst in the third quarter to beat a Jerry Sloan-coached Chicago Bulls team. A few months later, Maravich’s time with the Jazz would be over. But that memory would stay fresh in Fredman’s mind forever. Maravich finished the season with the Boston Celtics but decided to retire the next fall at the end of training camp. That’s when Layden offered Maravich a job—a chance to return to the Jazz as an assistant coach. Maravich returned to Salt Lake City in December of 1985 when the Jazz retired his number, hoisting his No. 7 jersey to the rafters. Maravich struggled under the weight of expectation at different times during his career. He admitted to considering quitting in the middle of one game in New Orleans—after scoring 35 points in one half. Looking back, Nissalke has had some regrets over the years. The Jazz won just 25 games that first year in Utah. “If I had it to do it over again, I probably would have said, ‘Let’s play him anyway because he’s a better player than these young players we have,’” Nissalke admitted to The Salt Lake Tribune at Maravich’s jersey retirement. Three years after the retirement ceremony, Maravich died while playing a pickup basketball game from a rare and undiagnosed heart condition. He was just 40 years old. When he looks at the rafters at Maravich’s No. 7, Fredman feels some solace about the way the legendary player’s time in Utah played out. For more Utah Jazz history, click here.